A quick, nourishing, soothing vegan soup. Great for toddlers, or someone who is ill, or as a warm soup on a cold day. Put the potato starch (or flour) and oil into a soup pot. Stir them together. If you are using flour, heat and stir the mixture over medium heat until it gets thoroughly bubbly. If you are using potato starch, skip this step. Add all of the other ingredients to the pot, except the spinach and miso. If you are using miso: Scoop a few tablespoons of the soup into a coffee mug or bowl and stir in the miso. Turn off the heat under the soup pot. Pour the miso mixture back into the pot. Add spinach (still frozen is okay) to the pot. Heat to the desired temperature. Serve with bread, or Chebe breadsticks, and your favorite buttery spread, such as vegan Earth Balance spread. 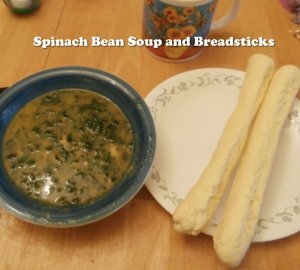 This soup is really yummy with bread or breadsticks dipped into it. See the recipe below for Chebe breadsticks.